On July 30, just days before the start of Canada’s second longest election campaign, the Government of Canada and the Government of Nunavut jointly announced a new deepwater port and sealift facility for Iqaluit, expected to cost approximately $85 million in total. The announcement was slim on specifics, although a Government of Canada press release describes how the completed port will reduce the offloading time of dry cargo from 60 working days to 20, and that fuel offloading times will be reduced from 15 working days to five. There is no mention of the intended location of the port relative to Iqaluit. This detail will have significant bearing on the relationship between Ottawa and the Nunavummiut if the port construction goes ahead after the October 2015 election. In 2005, Aarluk Consulting and Gartner Lee Limited produced a report for the City of Iqaluit, in which they recommend Innuit Head as the location of the port based on consultations with a broad range of local stakeholders. However, Nishi Khon/SNC Lavalin has conducted technical studies indicating that greater economic benefits could be seen by establishing a deepwater port instead at Kimmirut and connecting that southern Baffinland community with Iqaluit via a roughly 150 kilometre all-weather road. The Kimmirut location would certainly offer the greatest value as it is clear of ice for a greater portion of the year. However, estimates regarding the cost of the all-weather road have been as high as $1 billion, in part because the route would likely have to carve through the Meta Incognita Mountains. When the Kimmirut location was first proposed in 2003, local stakeholders also expressed concern that an all-weather road would have to pass through protected lands in Katannilik Territorial Park. Innuit Head would certainly be cheaper and would avoid the pitfalls of an all-weather road, but the sustained ice cover in Frobisher Bay limits the utility of this location for a deepwater port. While a port in the Nunavut’s largest community makes for good electoral optics, it dodges the question most important to Nunavut’s long-term economic development: the infrastructure deficit. No two Nunavummiut communities are linked by roads, and so any shipments or travel within the territory depends on the availability of seaplanes. The Nuuk Port and Harbour in Greenland. In any case, the establishment of a deepwater port somewhere in Nunavut would contribute greatly to economic self-sufficiency. 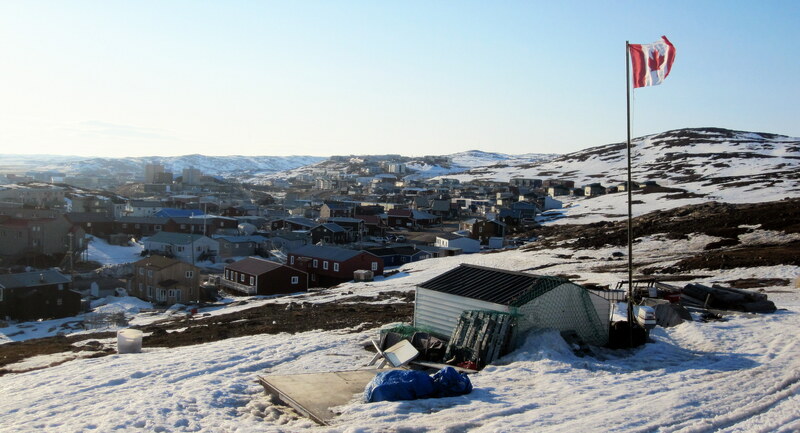 The lack of adequate docking and offloading facilities has prompted many Nunavut-based fishing vessels to seek ports in Greenland to deliver and process their cargo of turbot and Arctic char. It is difficult to determine to what extent Nunavut loses revenue to Greenlandic fish processing facilities, but Greenland exported more than $340 million worth of fish and seafood products in 2010 alone. By way of comparison, the fishing industry is estimated to contribute $14 million annually to Nunavut’s economy, but has a potential value of more than $86 million. Investments in a local processing facility, the establishment of a deepwater port somewhere in southern Baffinland, and a three-year multi-species exploratory fishery study by the Government of Canada’s Department of Fisheries and Oceans could all help to bring about a similar level of economic development in Nunavut as has been seen in Greenland. As such fishing operations would not venture further north than Qikiqtarjuaq, Canada would not be in violation of the moratorium on commercial fishing in the high Arctic agreed to in July 2015 by the governments of Denmark, Norway, the United States of America, and the Russian Federation, as well as Canada. Of course, this potential boost to political devolution and economic self-sufficiency in Nunavut will depend in large part on who will be in power in Ottawa after October 19 and whether they see the value in investing in the future of Canada’s Arctic. With an annual budget revenue of $1.7 billion, $1.5 billion of which comes from federal transfers, the Government of Nunavut simply does not have the resources to go it alone on the $85 million Iqaluit port, let alone a $1 billion infrastructure overhaul centred on Kimmirut. Is Equity-Financed Tuition a Viable Alternative to Student Debt?